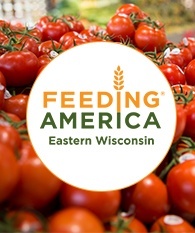 Feeding America Eastern Wisconsin is a food bank that distributes more than 20 million pounds of food a year to 1,000 pantries, meal programs and other nonprofit agencies that serve 330,000 people in eastern Wisconsin. Our promotions for Feeding America kick off August 1st and continue until October 31st. We are looking forward to supporting this great organization. Check out our schedule of events below. 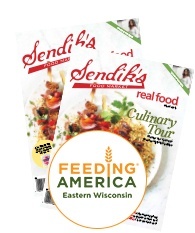 Sendik’s Real Food magazine will sell for $1.99 each with all proceeds going to Feeding America Eastern Wisconsin. Ask your cashier to round up your total to the nearest dollar. 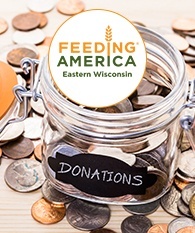 All of the money collected will go toward Feeding America Eastern Wisconsin. 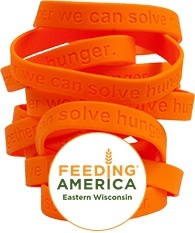 Orange Bracelets will sell for $1 each with all proceeds benefiting Feeding America Eastern Wisconsin.